Last week, I reported on some claims by Australian private sector economists that the Australian government was deplete of policy tools (“run out of ammunition” was the cute term used among these self-serving characters) and would not be able to handle the Brexit fallout – see When journalists allow dangerous economic myths to pervade. It was obvious that the statements were nonsensical and only reflected the dangerous neo-liberal ideology that discretionary fiscal policy should be constrained to the point of being not used! In the last week, some major central bankers around the world have given speeches which suggest they also understand that fiscal policy has come to the fore and provide some certainty to the world economy. The latest estimates from the ECB of the Eurozone output gap certainly provide the evidence base to justify a major expansion of fiscal deficits across the Eurozone. The research is suggesting that there is a significant output gap which is evidence of insufficient aggregate spending rather than any structural shifts in potential GDP. I guess they are warming the Member States for more expansionary action although the message is very clear – the European Commission has to abandon its austerity mindset and provide some old-fashioned deficit stimulus – quick smart! On Brexit, last time I looked (early this morning), British government bonds have risen substantially in price on the secondary markets and the yield curve has fallen rather symmetrically across all maturities. In other words, the bond investors do not believe the British government is going to run out of cash and are falling over each other to buy the gilts. But that was a little aside. Bank of England governor Mark Carney gave a speech last week (June 20, 2016) – Uncertainty, the economy and policy – which was a post-Brexit attempt to calm people down. The result of the referendum is clear. Its full implications for the economy are not. The UK can handle change. It has one of the most flexible economies in the world and benefits from a deep reservoir of human capital, world-class infrastructure and the rule of law. Its people are admired the world over for their strength under adversity. So uncertainty with a lot of confidence in the future replaced his political claims before the vote that the outcome would be a disaster! But cynicism aside, Carney also admitted that while the “near-term challenges facing the UK economy can’t be wished away … they can be addressed” by policy makers who adopt a “clear plan” and implement policy measures “with resolute determination”. No free market here – a clear policy plan based on resolute intervention! … will not hesitate to take any additional measures required to meet our responsibilities as the United Kingdom moves forward. Part of that plan is ruthless truth telling. And one uncomfortable truth is that there are limits to what the Bank of England can do. In particular, monetary policy cannot immediately or fully offset the economic implications of a large, negative shock. The future potential of this economy and its implications for jobs, real wages and wealth are not the gifts of monetary policymakers. These will be driven by much bigger decisions; by bigger plans that are being formulated by others. However, we will relentlessly pursue monetary and financial stability. And by doing so we will facilitate the adjustments needed to realise this economy’s full potential. And those “others” are HM Treasury – the designers and executors of fiscal policy. The Bank of England has its “others”, the ECB has its “broader set of actors” but both are pointing in the same direction – to fiscal policy. The background that Praet was referring to included the “lack of clarity for firms and households over the future institutional architecture of EMU” – who would have thought – 16 years after the common currency came in there is still a lack of clarity! He said this lack of clarity was introducing uncertainty which constrained the recovery in the Eurozone. 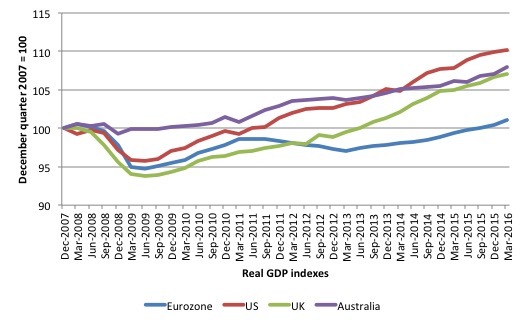 Here is my latest real GDP comparison graph showing indexes from December-quarter 2007 to the March-quarter 2016 for the Eurozone, the US, the UK, and Australia. The fiscal effect is very clear if you are not in neo-liberal Groupthink denial. The US, UK and the Eurozone economies turned down about the same time and the initial amplitude of the downturn was very similar. The Eurozone lost 5.3 per cent of its output, the US 4.2 per cent, and the UK 6.2 per cent by the June-quarter 2009. Discretionary fiscal stimuli were introduced in all three economies (in the Eurozone via the individual Member States) and the recovery began. In the US, while the fiscal stimulus was less than necessary, it was sufficient to sustain the growth, albeit at modest rates. In the UK, the election of the Tory government in May 2010 and their austerity push, which began with their first fiscal statement in June 2010 slowed their recovery noticeably. Once George Osborne relented in 2012 and allowed the fiscal deficit to rise, the recovery strengthened. But the austerity imposed still delivered an inferior out come to the US. The Eurozone is the basket case – it has barely reached real output levels that it had at the peak in early 2008. The introduction of austerity across the monetary union stopped the recovery in its tracks in the March-quarter 2011 and for the next two years output collapsed again (a 1.6 per cent contraction across the union). Of course, in individual Member States the contraction is not yet over and has been nothing short of dramatic (Greece, Spain, Portugal etc). It is so obvious that the differential use of fiscal policy accounts for the differences in output fortunes between these three economies. The case of Australia is instructive. It did not experience the same downturn because the government at the time introduced a massive and early fiscal stimulus. However, by 2012, the neo-liberal doomsayers were going crazy and the government lost its nerve and reverted back to the ‘surplus at all costs’ mantra. From that point on, the recovery faltered and our economy has barely grown at all. All of this is background to a summary of an ECB Working Paper – How large is the output gap in the euro area – which the ECB published in their ‘Research Bulletin’ on July 1, 2016 in advance of the actual Working Paper being released. While the lag between the Bulletin and the release of the Working Paper might be incidental, I take the early news report in the Bulletin of the research to be a signal that the ECB is smoothing the waters to support the call for broader policy stimulus – along the lines of the Praet speech in London the same day. The research results are rather interesting and indicates that some econometric manipulation is going on within the ECB that differs from that which has been producing output gaps within the IMF and the OECD (and earlier ECB work). By way of background, the output gap is usually defined as the difference between actual and potential real GDP, expressed as a percentage of potential output. Many agencies publish estimates of output gaps for their countries. For example, the – US Congressional Budget Office (CBO) regularly puts out estimates of the GDP and unemployment gaps as part of their exercise in decomposing the federal budget outcome into cyclical (automatic stabilisers) and structural components. I won’t go into detail here – please read my blog – Australia output gap – not close to full capacity – for more discussion on this point. Also, if you are interested in the technicalities then see my 2008 book with Joan Muysken – Full Employment abandoned – where we go into the mathematical and econometric aspects in considerable detail. Suffice to say here that the standard mainstream method typically estimates potential GDP using some mathematical model which defines the potential the economy can reach as that point where the unemployment rate equals some estimated Non Accelerating Inflation Rate of Unemployment (NAIRU) or ‘natural rate of unemployment’. The NAIRU is, itself unobserved. So, the problem is that intrinsic to the computation is an estimate of the so-called ‘natural rate of unemployment’ or the NAIRU. This is the mainstream version of “full employment” but is, in fact, an unemployment rate which is consistent with a stable rate of inflation. Please read my blog – The dreaded NAIRU is still about! – for more discussion on why the NAIRU is a flawed concept that should not be used for policy purposes. Within the literature you will find huge variations in the estimates of the NAIRU sometimes varying between 8 per cent and 3 per cent. The methodology is so flawed that it is not a reliable construct upon which to base policy. The estimates typically lead to a measure of full capacity that is well below what is reasonable. For example, mainstream economists claim that Australia is operating close its NAIRU at present yet there are 15 per cent or more available workers without work (either unemployed, underemployed or hidden unemployed). Therefore, it is wise not to take the estimates of potential GDP as an indicator of a fully employed economy. The problem is that policy makers do take these estimates serious and constrain their economies to achieve this (assumed) cyclically invariant benchmark. In other words, they typically underestimate the true output gap and start tightening policy well before the economy reaches full employment and therefore they deliberately run the economy with elevated levels of unemployment. This understatement of the true output gap – the degree of slack in the economy – therefore means that policy makers are biased towards adopting an excessively austere fiscal policy approach. It also leads them to claim the economy is operating at near or at full employment, when in reality, the broad labour underutilisation indicators might be signalling massive wastage. Which brings me to the latest ECB estimates. The best model according to this evaluation criterion provides accurate inflation forecasts and implies that the output gap in the euro area was about -6% in 2014 and 2015, on average. This estimate implies a much wider gap between actual and potential output than alternative institutional assessments (which estimate that the output gap in the euro area was between -2% and -3% around that time), suggesting that the latter may underestimate the extent of economic slack in the euro area. A possible implication of this finding is that policies aimed at stimulating aggregate demand (including fiscal and monetary policies) should play an even more important role in the economic policy mix. The ECB provides this graph which shows the “Alternative estimates of the output gap in the euro area (percentage points), which really shows how variable the estimates can be depending on assumptions made in the underlying model. Chart 1 shows that it is important to discriminate among modelling assumptions. In fact, while the alternative estimates agree about the timing of peaks and troughs, they disagree about the level of the output gap. Such differences are economically relevant: the output gap in 2014 and 2015 was, on average, close to -2% according to some estimates, and -6% according to others. In terms of how the latest preferred ECB estimates of the output gap line up with the “alternative institutional assessments” of the gap in the Eurozone, I constructed the following graph. The ECB currently hasn’t published the quarterly estimates of their output gap (for Model 4) so I interpolated it from the above graph and approximate the line in the graph below (blue line). It is not exact but near enough for my purposes here. 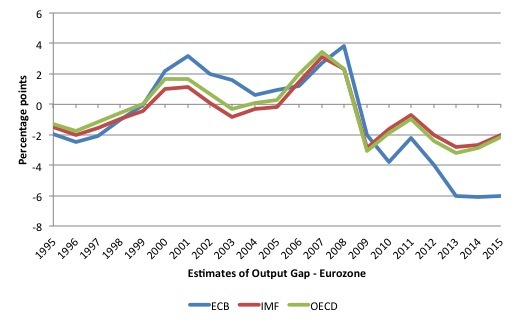 The other lines are the official IMF and OECD estimate of the Eurozone output gap from 1995 to 2015. The latest ECB model 4 produces much larger output gaps in the current period, which suggests that calls in the past by the OECD and the IMF for fiscal austerity and structural reforms have been made based on much more optimistic assessments of the state of the Eurozone economy than it the reality. This reinforces the point I made above about biased estimates which understate the degree of slack in the economy. For those who do not necessarily read all this stuff, the output gap measures also influence the way the so-called structural fiscal balance is measured – which is the deficit or surplus that would be observed at full employment (or potential). So if the measure of the output gap is biased downwards the assessment will be that the economy is closer to full employment than it is and therefore, in turn, the current fiscal position will be estimated to be more structural and less cyclical. In other words, estimates of structural deficits will be much higher than is the actual case and if nations use fiscal rules that relate to some limits on structural deficits (such as the Stability and Growth Pact in the Eurozone), then fiscal austerity will be imposed well before any policy tightening is justify by the reality of the situation. Which means the economy will be deliberately depressed (as in the graph I presented at the outset). So how did the ECB choose the “best model” – which is Model 4 in the above graph? The criterion used to rank the different output gap estimates is their ability to forecast inflation in an evaluation which takes into account the data releases available in real-time. This reflects the way the New Keynesian modelling approach works. In this blog – Mainstream macroeconomic fads – just a waste of time – I provide a critically assessment of the New Keynesian approach. In this approach, a Phillips Curve is defined in relation to the inflation rate and the output gap, such that as the output gap rises the inflation rate falls. I won’t repeat the criticism of the dodgy way the New Keynesians depict that relationship work. But the New Keynesian Phillips curve bears a close resemblance to the Expectations Augmented Phillips curve, the latter being based on natural rate theory inherited from Milton Friedman and Phelps, which defines full employment in terms of the NAIRU and eschews any influence of fiscal policy on the NAIRU. So there is no long-run trade-off between inflation and unemployment (and maybe very little trade-off in the short-run) and any attempts by the government to use fiscal policy to enforce a trade off if they consider unemployment is too high will only cause inflation. It is an ideological construct in the main. But while it is based on the Monetarist idea of no long-run trade-off, the real world clearly demonstrates that there is some sort of trade-off so the New Keynesians fudge that result by adding adjustment lags imposed on the normal natural rate story. But, of course, the underlying theory that justifies the approach does not allow for lags because it is based on so-called ‘rational expectations’ where all people know exactly what the future will be (on average). In other words, the real world defies the underlying theory so the New Keynesians just add some fudges (lags) in an ad hoc manner to capture the lagged dependence between output and inflation taken into account. The conclusion is that in claiming superiority over older Keynesian approaches because they build their models from their ideological first principles (free markets and rational expectations) the New Keynesian theory ends up having no capacity to talk about the real world. So like most of the mainstream body of theory they claim virtue based on so-called ‘microeconomic’ rigour but respond to anomalies that are pointed out when that ‘rigour’ fails to deliver anything remotely consistent with reality, with ad hoc (non rigourous) tack ons. Thus, at the end of the process there is no rigour at all and any claim to theoretical superiority is bunk. However, we can accept for different reasons that inflation responds to economic activity and when the economy is performing well below potential, deflationary forces are more likely to enter. They say that this Model is “more sensitive to current economic conditions” rather than being more dependent on the past. Importantly, they compare the two competing ‘best’ models (the actual best Model 4 with Model 6). This graph shows the comparison in terms of the underlying estimates of potential GDP. The red line is Model 4 and the blue dotted line is the actual (log-level) real GDP. The black line is Model 6 estimates of potential GDP. 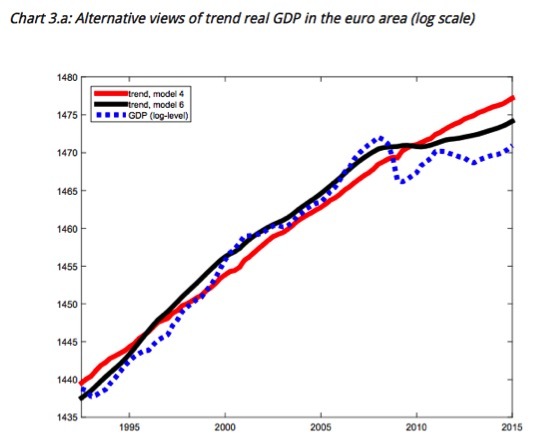 … the two models capture two polar views on the post-financial crisis sluggishness of economic activity in the euro area. Model 4 implies that potential output growth (i.e. the slope of trend growth in Chart 3.a) has not changed much over time and the recent sluggishness in real GDP in the euro area reflects a large output gap. What that means is the the problem in the Eurozone is one of deficient aggregate spending brought on by excessive fiscal austerity at a time when non-government sector spending is weak and insufficient to drive output to its potential. This is an important conclusion. The ECB recognise that it runs counter to the so-called “secular stagnation” hypothesis, which is being used to justify fiscal austerity – in the sense that the potential GDP path has flattened and the output gap is not that large. This conclusion is devastating for those who claim that all the policy action should be on the supply-side – the so-called structural reforms and reinforced with fiscal austerity. The estimates from the ECB clearly justify fiscal expansion – “policies aimed at stimulating demand” – although in the context of the Eurozone and the ECB’s own role the underlying message is that the ECB is planning to introduce what they would consider to be even more expansionary monetary policy changes. I need to wait for the publication of the actual Working Paper before I am fully across how they came up with the various models. But the results speak for themselves – the Eurozone is being starved of aggregate spending (measured by the significant output gap of 6 per cent) – and policy settings must change. The most effective way to deal with the output gap is to reverse direction on fiscal policy (abandon austerity) and support it with ECB funding. I am not holding my breath! Great analysis as always bill. One question I’m wondering if maybe one of your more enlightened readers could answer is what happens to bad loans (eg Italian banks currently) and bankruptcies that essentially require euros to be written off. Where do the Euros come from to replace the removed euros? Am I missing some mechanism or dies Italy need to borrow euros from another country ie. Bonds? UK & Euro Central Bank inching toward the ultimate taboo … speaking that which must be spoken ? “Fiscal Policy” – …. ? There, we said it. Let’s count to 30 and see what happens. no earthquakes, plagues, locusts .. hellfire & brimstone? So why the taboo? What’s source of so much contention that it becomes an anthropological taboo? We’ve developed a fearful dread of “making a more perfect union” ? So the contentions & taboos are NOT about the fundamentals of currency creation, they’re about OTHER ASPECTS OF POLICY, and what mechanisms competing factions use to control them. After that, the shortcuts in political rhetoric start to pile up, slip from abstract to overt lies, and eventually paint whole electorates into nominal corners. In the end, it’s always the same question. Whose face gets save, political elites, or the distributed faces on Main Street. Inevitably the current crop of Control Frauds have to cede power, but they’ll try every trick imaginable to secure a golden parachute before their staged retreat edges off the stage. The sane advice is always the same. Trust your electorate, find out what they really say, and then stick to principle, the sooner the better. Germans learned all the wrong lessons and have causality backwards. They came with some insane ideas about ordoliberalism etc. And now we have a mess because those insane ideas have permeated all spheres of policy-making in Europe. Permanent depression is what you get with a pseudo-gold standard, and that’s what we got because all the faux ‘moralism’ of the economic elites in Europe. It took a word war to put the economic ideas that Heinrich Brüning shattered Germany with in a mothproof bag. But someone opened the bag and let it out and now it has to be destroyed permanently. Next week super Mario probably will come out and tell the Europeans that the course is steadfast, Ricardian Equivalence rules. As Heinrich Brüning was a firm believer to the last days of his rule, the “victory” was just around the corner despite that the entire Germany was crushed in pieces around him. In those days both extreme left and right had at least other ideas how to run the economy. Today also they are all in the believe of balanced budgets and “sound” public finances. Everybody is entrenched in ideologies of finances far away from the real economy where the citizens live. The question is will take another devastating war to put those ideas on the sideline. Talk and common sense don’t seems to have much of an impact. “But who cares about the economy today? Every day, programmes [on “economy”] are broadcast. But there is no discussion of the economy, only of the finances. Short- and long-term interest rates, budget deficits, equity quotes and whatnot are discussed, but not the economy. The “economy” is not the same thing as the “finances”. The economy is human activities, the way we create value by using our knowledge and talents. Today’s waste of human resources has no place in the cynical world of finance. Not only the budget was decontaminated, heterodox economists is nowhere to be seen in Sweden the last 15 years, but they were already before a rare species.